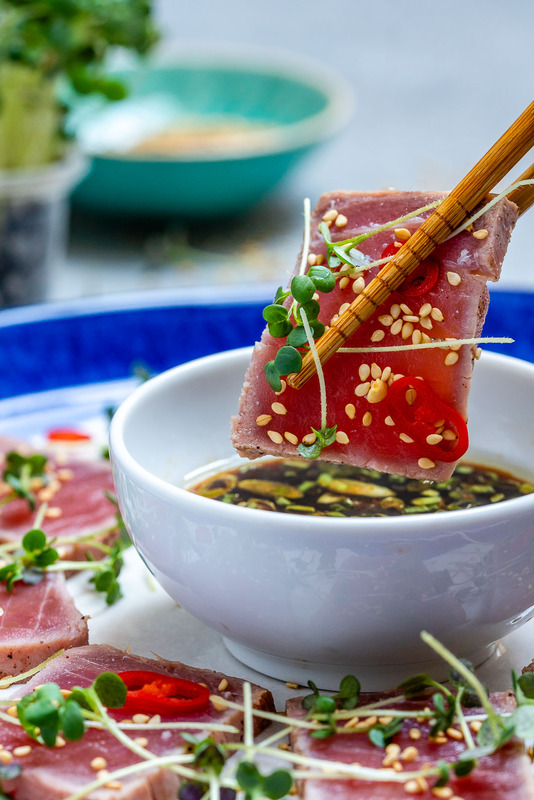 This pan seared tuna tataki recipe takes less than 10 minutes to make. 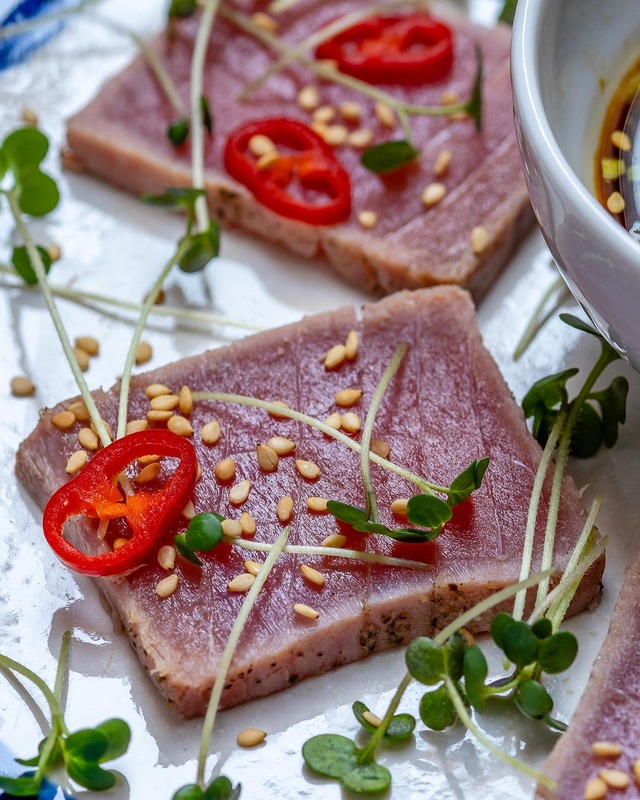 I learned it when I was working at Zuma in London and it’s one of the best seared tuna recipes. What do you think about the Japanese cuisine? I mean, I know everybody loves sushi, but how many of you went further and tried other Japanese dishes, like sashimi or tataki? 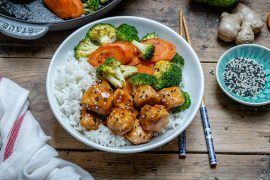 If you didn’t try any of them it’s time to change that because the Japanese cuisine is one of the healthiest in the world. It’s actually a known and proven fact that people in Japan live longer than almost anywhere else in the world and they lead a disease-free life. This is attributed mostly to their cuisine, so it would be wise to learn from them and insert some of their dishes into our regular diet. 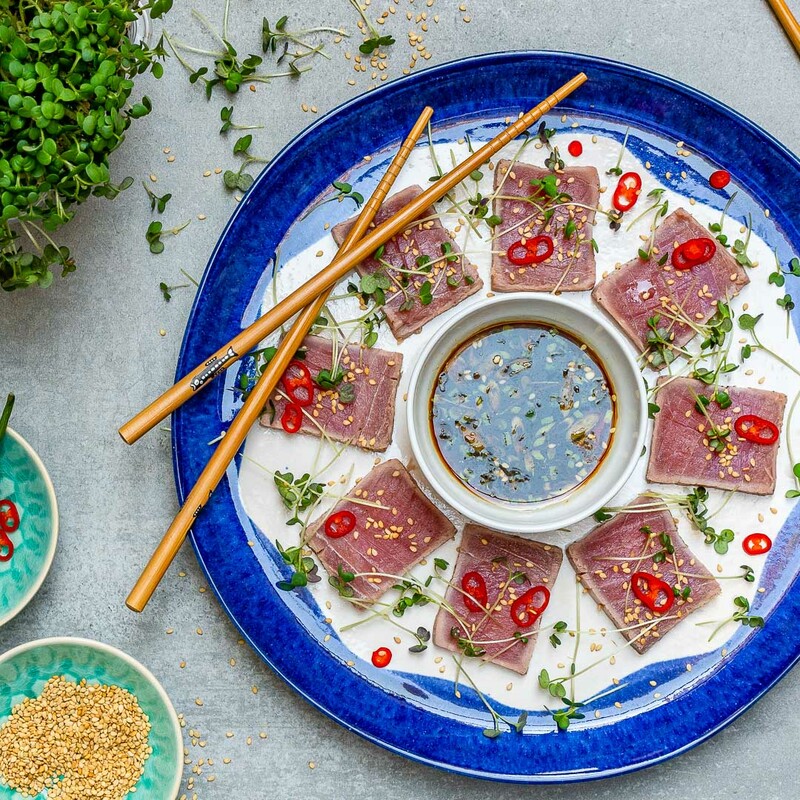 Hence, today I am going to show you how to make a healthy and easy seared tuna tataki recipe. Oh, and if you did try them, trust me, you still want to give it a shot. Because I learned it while I was working at Zuma London, which is one of the best Japanese restaurants in the world. So this delish was designed by some of the best chefs. But don’t let that scare you, this seared tuna recipe is not just for the pros. Actually, you’ll be amazed by how simple it is. 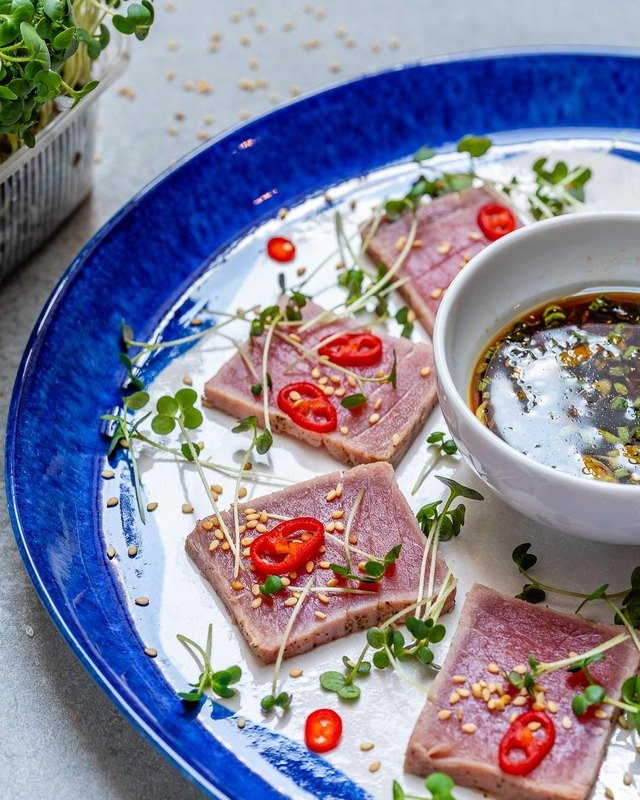 You’ll learn how to make tuna tataki at home so you won’t pay a fortune for it anymore at some fancy restaurant. Now, I know some of you don’t know a thing about Japanese cuisine, diet or tataki. I didn’t know it either before working in a Japanese restaurant. Thus, I would like to give you a few details about today’s delish before making it. 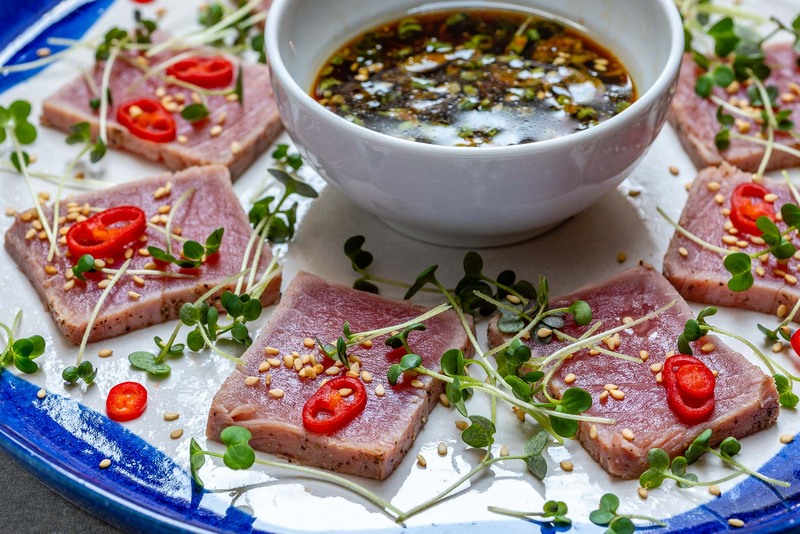 And even if you are knowledgeable about it, I still suggest going through my tips and tricks before making this pan seared tuna tataki. According to Wikipedia, Tataki is a Japanese method of cooking meat or fish. It requires searing the meat in a hot pan, on each side, then slice it thinly. Tataki is usually served with sesame, ginger and soy sauce, kind of like sashimi. The difference between them is that sashimi is 100% raw, while tataki has that seared outside crust. It is usually made with beef, tuna or salmon. Now that you know what it is, it’s time to find out how to make it. It is very important to make it with the freshest tuna you can find. And this goes for any raw fish meal whether it’s sushi, sashimi, or even ceviche. Make sure you specify this to the fishmonger when buying it. 2. Which tuna is best for tataki? The best fish for tataki is ahi also known as yellowfin tuna. However, this is not always easily available, so in this case, you can try it with the regular frozen tuna blocks that you can find in fish stores. If you can’t find it cut into blocks, you can get a thick piece of tuna steak, but the cooking time will be different because you can only sear it on 2 sides. In this case, you’ll need to sear it for about 50-60 seconds per each side or until a thin crust forms. You need to grease the pan with oil and heat it well before placing the tuna in. Cooking time depends on how big your tuna block is. Mine was about 4cm / 1.5inch and I seared it for about 15-20 seconds on each side. If yours is larger, it will take a bit longer so you’ll need to pay attention to see when it forms a thin, white crust on the outside. But don’t leave it too long. It should still be raw (and pink) on the inside. It’s usually served with ginger, soy sauce and sesame. But you can tweak the sauce to your taste. For instance, you can add it different citrusy flavors like orange or grapefruit. Garlic would be a great addition and also hot chillis if you like it spicy. It’s best served as an appetizer but I sometimes enjoy it as a snack next to a glass of wine. get ahi (yellowfin) tuna if you can. If not, the regular frozen sashimi-grade tuna blocks will do. grease and heat the pan before placing the tuna in. add sesame, ginger and soy sauce. Remember you can tweak the sauce to your taste. 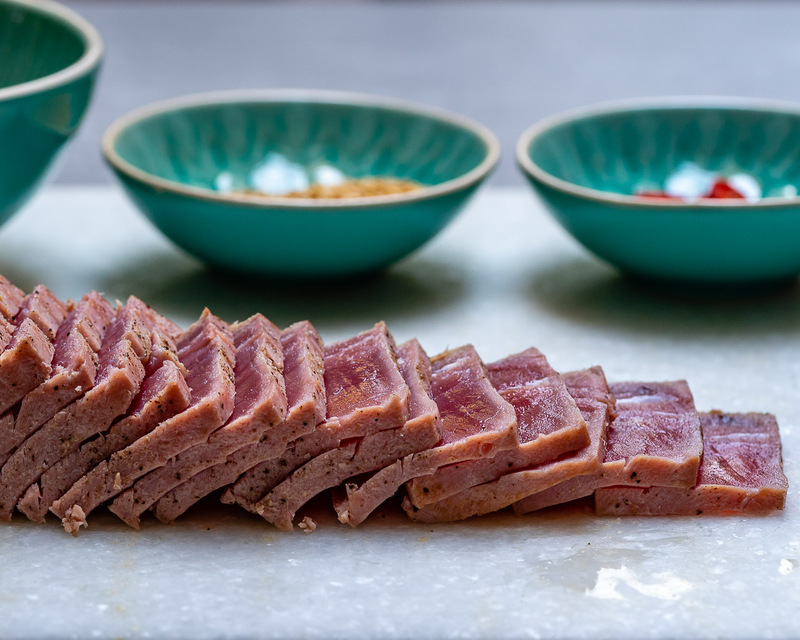 Now I’m sure you’re ready to make the best seared tuna tataki, so fire up the stoves and let’s cook Japanese. 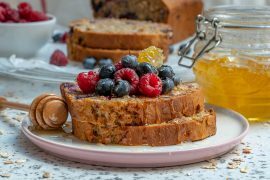 And if you like this recipe video and want to see more, please Subscribe to my YouTube Channel. 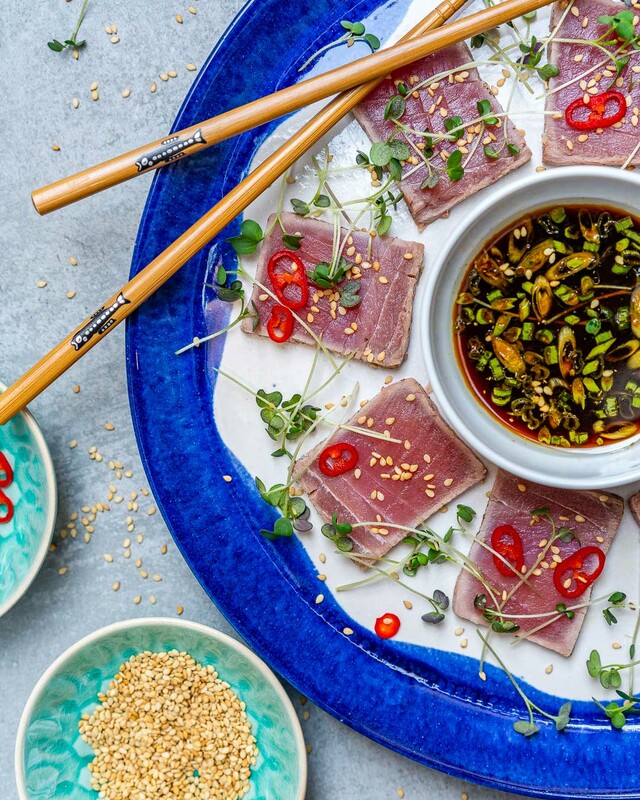 This pan seared tuna tataki recipe takes less than 10 minutes to make. It's quick, healthy and so delicious. In a small bowl, mix together all Tataki sauce ingredients and set aside. Heat a bit of oil in a non-stick pan over high heat. Place the tuna on a clean board or plate and season generously with sea salt and freshly ground black pepper. Sear the tuna for 15-20 seconds on each side, and be careful not to overcook. Transfer the cooked tuna on a clean board and let it rest for about 5 minutes. Slice it thinly and make sure you cut against the grain, then set it on your serving plate. Garnish the tuna with sprouts, chili slices, and sesame seeds. Serve with Tataki sauce and Enjoy!
! 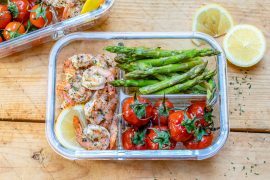 Please read the tips and tricks in the article before making this recipe!